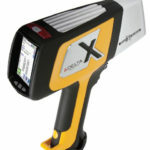 Very accurate and fast non-destructive chemical analysis of metal and non-metal materials. Instant verification of material quality and norms with regard to trace elements. Fast positive material identification – PMI, material replacement, quality control and quality assurance (QC and QA). Classification of metal materials and chemical analysis of metal waste. Analysis of iron ores including Al, Mg, Si, P, etc. Visual control suitable for inspection of hard-to-reach places. The endoscope’s diameter in the range of 0.7 to 25mm provides excellent image projection. The great resolution and diameter nominal also make inspection of the smallest details easier. Professional ultrasonic thickness gauge designed for measuring of metal and non-metal materials. Makes it possible to easily measure wall thickness of piping, pressure vessels, tanks and other components. IČO: 04856562. Společnost je zapsána v obchodním rejstříku Krajského soudu v Plzni, oddíl C 32378.